August 31, 2011 Adri H.
Just published this one via Ravelry! 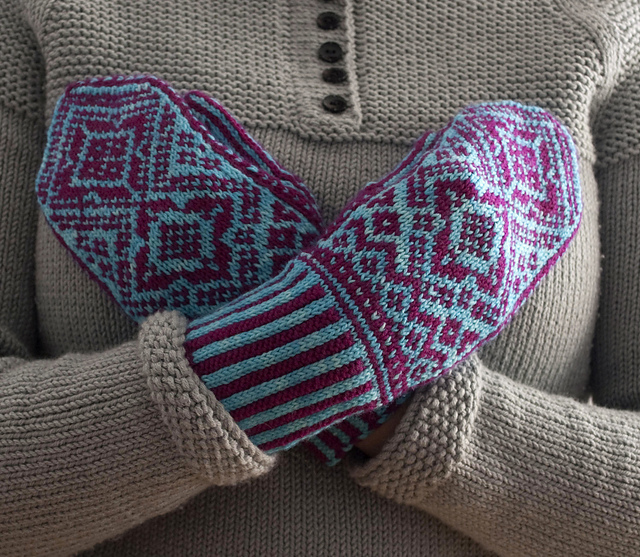 Hopi Mittens are a pair of fair-isle mittens knitted with only 2 colors throughout. Recommendation: These are a good second project for the fair-isle beginner. Why second project? Usually, if this is your first fair-isle project, your first mitten will be a different size than your second. As your gauge relaxes and you get better at knitting in fair-isle, the difference in tension will show between the two mittens. Tee hee. Ask me how I know. These mittens were inspired by patterns I had seen on the pottery of the Hopi people of the Southwestern United States. The mittens begin with a two-color ribbed cuff and transition into a Fair-isle motif. The thumb gusset is steadily increased and then left open with stitches held on scrap yarn or a holder while the main mitten is knitted to completion. Stitches are then picked up around the thumb opening and knitted to create the thumb. The way the sizes are made is via thicker yarn and larger needles. So the smallest size is made with sock weight yarn and around 2.5mm needles. The larger sizes are made with sport weight and DK weight yarns and various needle sizes. So, the needle sizes vary from US Size 1 / 2.25mm to US Size 8 / 5mm depending on size desired and gauge with yarn. Sizes Available: 7 (7.5, 8.25, 8.5, 9)" palm width. Sizes are achieved using different weights of yarn and needle size. These sizes are calculated using the gauges below. 33 (31, 28, 27, 26) sts = 4" in fairisle pattern for sizes 7 (7.5, 8.25, 8.5, 9)" or 18 (19, 21, 22, 23) cm palm width measured around thickest part of palm.